1. Melt the butter in a frying pan or medium casserole and add the fennel and some seasoning. Cover the pan and cook gently for 10 minutes, stirring regularly. 2. Add the sliced leek to the pan and cook (again covered) for 5 minutes more until both leeks and fennel are soft. Tip in the wine and crème fraîche, and simmer with the lid off for around 3 minutes, or until the liquid is reduced by half. 3. 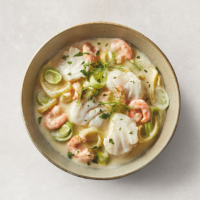 Nestle the chunks of fish and prawns into the vegetables. Cover once more, then simmer for 6-8 minutes until the fish is opaque and just flaking and the prawns are pink and opaque. Season, scatter with the fennel fronds and chopped parsley, then serve with crusty bread.